Born on November 15, 1891 in Heidenheim, Wurttemberg, Erwin Johannes Eugen Rommel joined the German Army in 1910 and served in World War I in France, Romania and Italy. Rommel is most famous for his command of the Afrika Korps in North Africa in 1942 and 1943, at which time he earned the nickname the "Desert Fox," for his ability to move his forces in ways the Allies could not predict. Although Rommel was initially very successful in North Africa, the Afrika Korps were eventually driven out of the region in May of 1943 following their defeat at El Alamein, Egypt. Rommel was not present in Africa at this time, as he had been recalled to Germany in March of 1943. 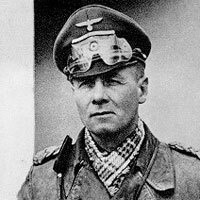 Rommel's next assignment was to command the defenses of the highly-touted Atlantic Wall. Rommel realized that these defenses were weak, and went about doing everything in his power to strengthen and fortify these positions. Of the defenses put into place, one even bore his name, an obstacle known as "Rommel's asparagus." In spite of his efforts, Rommel had difficulty in assembling a proper defense force, in part due to conflicting views on how defending units should be placed, and because of Hitler's unwavering demand that his forces fight to the death and not retreat or give up ground. On June 6, 1944, Rommel was in Germany celebrating his wife's birthday, and did not make it to the Normandy coast until 10:00 that evening. By that time the Atlantic Wall had already been breached, and the Allies had established footholds on each of the invasion beaches. Rommel was later implicated in a plot to assassinate Hitler, and on October 14, 1944 he committed suicide in order to protect his family and avoid a public trial. Rommel was never a member of the Nazi party. Captain Miller makes reference to Rommel when explaining to his squad the importance of the bridge at Ramelle that spans the Merderet River. In order to move armor into a position to defend the port of Cherbourg, Rommel would have needed the control of as many bridges as possible.